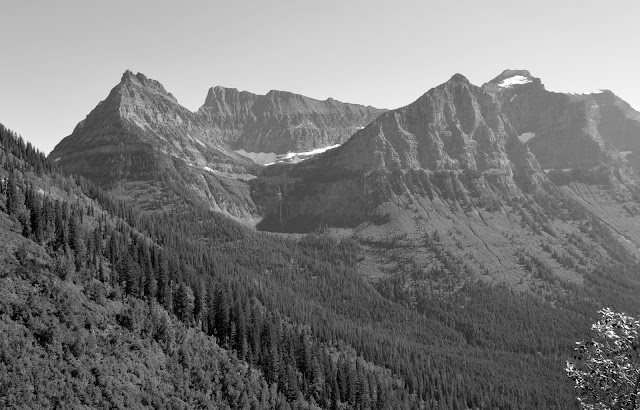 Another place in Montana that I hold dear in my heart is Glacier National Park. There is no place like it. 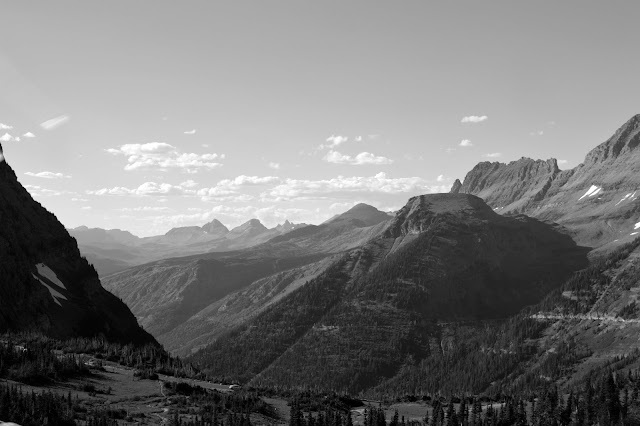 The mountain views are priceless and Going To The Sun Road is the best place to view them. Every since I married my husband a decade ago, I dreamed of the day we'd return again with our kids. We hadn't been to Logan Pass, the area with Going To The Sun Road, since. I was really missing that drive full of scenic viewpoints. So during our visit this time, my parents offered to accompany us since they've lived in the area their whole life and knew it like the back of their hands. Our first stop was the Hungry Horse Dam. A place I have many memories of as a kid, I remember looking down and feeling a little scared, but not too much since heights never really bothered me. Then we stopped at the Huckleberry Patch in Hungry Horse for fudge and souvenirs. The Chocolate Peanut Butter Fudge ended up being just the perfect thing after our picnic at the top of Logan Pass that evening. Then we drove on to West Glacier, the entrance to Glacier Park. From there its another hour or so, depending on my many viewpoints you stop at. We only stopped once on the way to the top, at the Bird Woman Falls overlook, so I could take some photos. The cliffs are very steep, so having our sons running around wouldn't have been smart. More beautiful views awaited us at the top of Logan Pass. The day was another hot one, but we walked around for thirty minutes taking it all in. Then we hopped back in the car and looked for a place to eat our picnic. Lunch Creek was just right. We all assembled our sandwiches and sat on the rocking wall and ate, trying carefully not to drop any food for the ground squirrels below. After eating, we drove around the corner and went through our third tunnel, honking as we drove through, a tradition my dad has always done. Our boys squealed with delight and continued to watch out the window for more waterfalls and mountains. Then around the corner was the Weeping Wall and I was able to get a shot of the tall waterfall as we drove past. Since we were at a height elevation, patches of snow were in abundance and we watched as visitors took selfies and tried not to fall. On our way down, we saw two Mountain Goats. Visitors were blocking our view as they tried to get the perfect close-up. 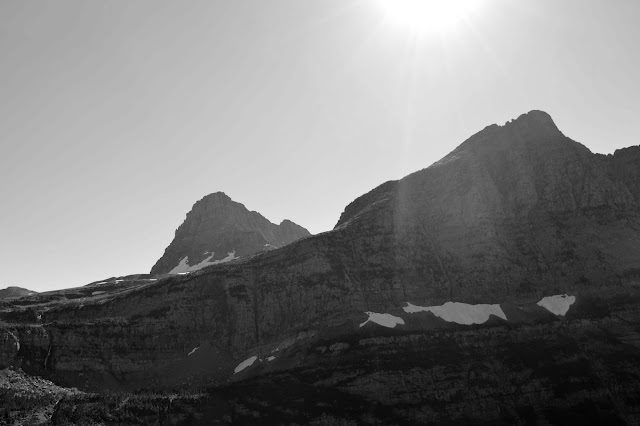 As you reach the bottom of Going To The Sun Road, there are many campgrounds and places to hike. My mom baked a Huckleberry Peach pie earlier that day at home and packed it in her cooler. So we stopped at Avalanche Creek to eat pie. I couldn't think of a better ending to the day then eating homemade pie, can you? On our way out of Glacier Park we drove by the Lake McDonald Lodge and saw where they park the Jammers, the red tour busses. The day was incredible and just like I imagined it would be a decade ago as a newlywed, dreaming of bringing my future family there. Until next time, GNP! All text and images copyright of Kelli Wong Photography, unless noted, and may not be used without permission. Visit Kelli's profile on Pinterest.